She grew up in a household that cooked and she learnt to cook as she watched and helped. The day her Dad let her make the gravy, she knew she had graduated from the family culinary school and she was ready to break out on her own! Sarah is married with four gorgeous kids. Her passion is cooking from scratch, additive free, nutrient-rich food for her family, as much as possible. 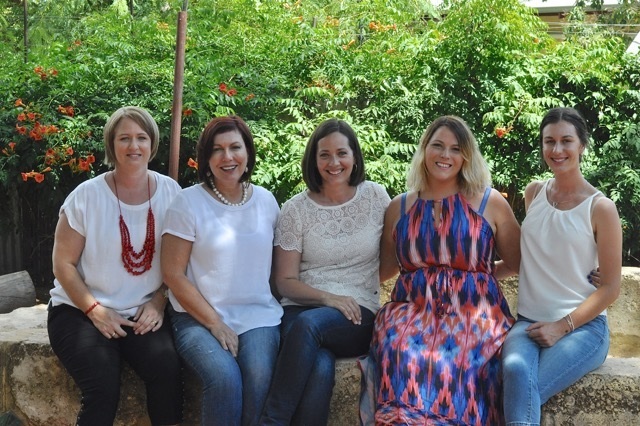 It became especially important to her after she bought a Thermomix over 6 years ago and read "Additive Free Pantry" by Julie Eady and "Changing Habits" by Cyndi O'Meara. As a childhood cancer survivor, she wants her kids to have the best head start in life as possible, and to teach them healthy eating habits and that real food tastes great (if not better than store-bought/processed). Sarah was a Thermomix Consultant for 4.5 years - sold over 500 machines and was one of the nation's top sellers and recruiters. Maddy has been working with Aunty T for a couple of years now. (Yes, she is literally a niece.) She helps out at cooking classes and book photo shoots in whatever way is required. She loves everything about food, making it, and of course eating it but is currently studying sports psychology at university. She's also a keen horsewoman and has won several events nationally. Madeleine Hart is a name to watch out for...in the future whether it be on Master Chef or in the sports arena. For as long as Gina remembers she has always adored food … eating it and being around it. One of six children, she had a healthy respect and appreciation for food, because it was a matter of eating food when it was on offer, or you missed out! Gina had a busy corporate career and eventually bought a Thermomix in 2011 so she could make some foods from "scratch". 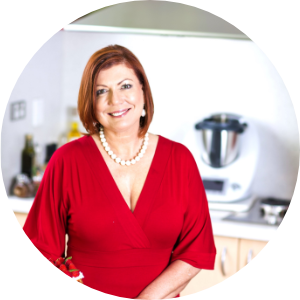 Within a few months she become a consultant and of course created heaps of recipes to share with her clientele. In November 2013 she completed Jude Blereau's Whole and Natural Foods Chef Training Course, a 13-1/2 week full time program that covered all aspects of wholefood cookery. She is still amazed at how life brings to you what you seek; as part of that course, she needed to complete a LOT of internship hours, which led her to Tenina, and the rest, as they say, is history! She also worked on Jo Whitton’s (now best selling) Thermomix cookbook which was shot in Perth. Better known to me as Tash, from Little Bit of Thyme we were friends as soon as we met just through blogging and Thermomix circles. Tash is an extraordinary addition to the team in that apart from great graphic and photography skills, she understands the whole concept of blogging, thermomixing and marketing and so when I put a call out for a graphic artist for ‘occasional’ work, I was not only suprised, but delighted when one of the first responses I had was from Tash. Nearly a year in, she may be regretting her keen response, but we certainly are not and I am sure you will start to recognise her stamp of excellence across a lot of what we now produce. And all of this whilst she raises a lovely family of four kidlets...for her gorgeous baby pics, or #jacobspam make sure you head on over to her social media sites. Bree is a recent addition to Team Tenina and comes from a family of 5 girls, so she knows how to find her place in our team of all women! She has been a vegetarian for the past 2 years. Luckily The Convenient Vegetarian is well...convenient! Bree has had a Thermomix for just over 4 years and she uses it every day as the family is completely additive free and she cooks everything from scratch. She finally met Tenina on the original 2015 Bali Foodie Feast (and I haven't been able to shake her since!) She has become a great help with prepping dishes for recipe shoot days, is now part of our live classes, shows up to webinars to answer the sticky questions for us and is coming to Bali Foodie Feast 2016...She also recipe tests...even the meat dishes. Now that is dedicated.